CopyrightsNow ™ makes it easy! New! A recent Supreme Court ruling requires you to register your copyright before filing a lawsuit to enforce your rights! All Copyright Applications require an additional filing fee of $35 - $55 paid directly to the US Copyright Office. To protect your work for life plus 70 years! * Your Time To Act Is Limited! You only have 3 months to register your copyright once your work is (1) published / distributed, and (2) before infringment occurs, to recover full damages and attorney fees. If you've written a book or created some other original work such as a blog, photo, or illustration, you must register your copyright to prevent unauthorized use. CopyrightsNow simplifies copyright registration, protecting you against illegal copying, theft or plagiarism of your work. But you must register your copyright with the U.S. Copyright Office to fully enforce your rights. CopyrightsNow features many shortcuts to speed data entry, and prompts you with only the screens you need for your specific application. A simple application with only one author and one copyright owner typically takes less than 5 minutes to complete. CopyrightsNow, is a practical, economical solution. While there is an online filing fee, payable to the US Copyrights Office, you won’t have to pay the larger fee for filing paper forms. CopyrightsNow provides real-time error checking and online help screens to help prevent you from entering inconsistent or questionable data which can cause your copyright application to be denied. You get the right help when you need it to immediately fix your application before you submit. And if you need additional help, the CopyrightsNow customer support team is available via e-mail to answer questions. Within 48 business hours of submittal your application will be reviewed by a CopyrightsNow specialist. If there are obvious issues, you will be notified via e-mail! While final reviews are performed by the U. S. Copyright Office, you will get added assurance that your application is properly formatted to speed the review process. 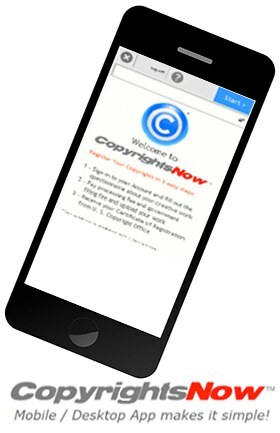 CopyrightsNow is available on the AppStore and GooglePlay for copyright registration. You can also use a web-browser from your desktop computer. Note: Although the App is FREE to download -- in order to use the App, the user needs to purchase a CopyrightsNow Account through Bowker to enroll and activate the service. Neither Digi-Rights® Direct LLC or its Affiliate Partners or Service Providers are attorneys and we do not provide legal advice regarding copyrights and licensing, and we are not liable for any damages resulting from reliance upon statements and tutorial material. The information contained herein is believed to be accurate at the time of publication. Consult with a competent attorney for specific legal advice.